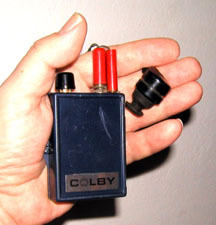 The 50th Anniversary of the Pocket Transistor Radio In early 1954, 12-year-old Chuck Colby of Torrance, California built what is believed to be the first commercial Pocket Transistor Radio, The Colby TR-2. It used two CK722 transistors. 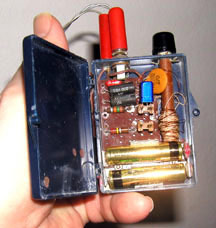 In the attached photo of the inside of the Colby TR-2, the CK722 transistor is the blue colored component. The other transistor is missing in this unit as it was used for 35 years by a night duty nurse, and while changing batteries; one of the transistors fell out and was lost. It was returned in 1990 , but declared out of warranty. . The CK722 was the first transistor that was available to the pubic. Introduced in 1952 at a price of $21 each, by 1954 the price had fallen to two or three dollars, so it was then feasible to build a low cost transistor radio using them. This transistor is so famous it even has its own website: www.ck722museum.com. Almost unbelievably, the first pocket Japanese transistor radios did not appear until 1957 and the Taiwan and Korean versions until the ‘60s. The first Sony portable transistor radio was not produced until 1955 (Sony TR-55) and the first Sony pocket sized unit (Sony TR-63) in 1957.